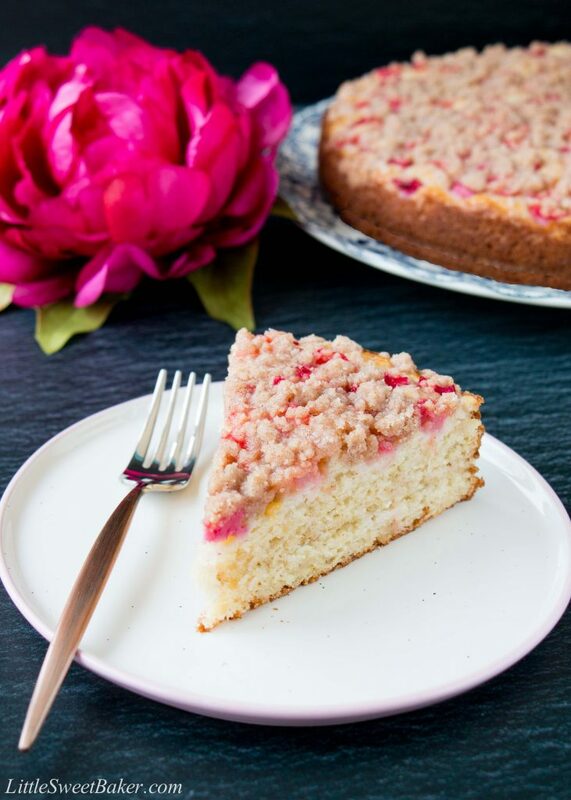 This is a moist sour cream coffee cake studded with beautiful pieces of rhubarb and topped with a sweet-cinnamon streusel. It’s a great way to enjoy rhubarb while it’s in season. To my disappointment, my rhubarb plant did not come back this year. I must have not given it enough love and attention last summer. However, both of my neighbours on either side of me have healthy rhubarb plants, and they both said I can help myself whenever I want. Yay for great neighbours! 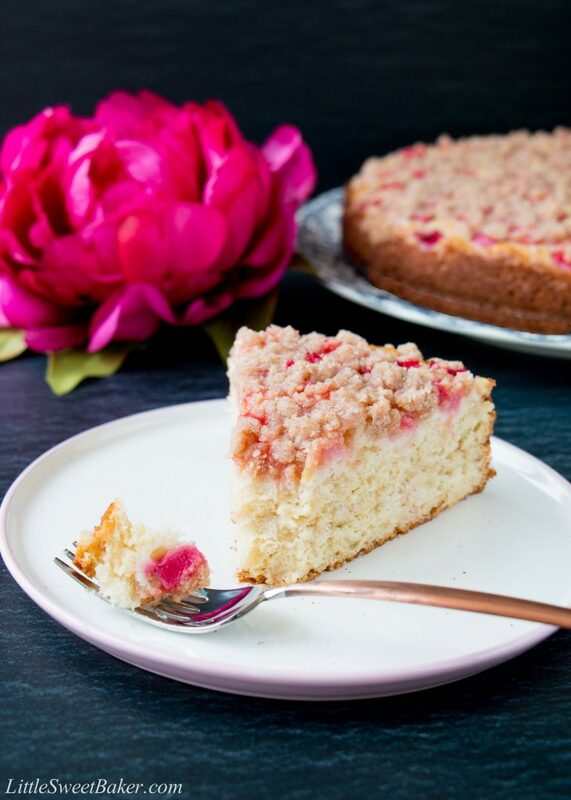 This rhubarb cake starts with my favorite sour cream coffee cake batter. 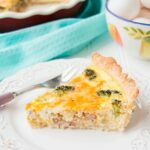 The recipe is actually low in fat because there is only 1/4 cup of butter and 1 egg in it. Yet it still has a buttery-rich taste to it. 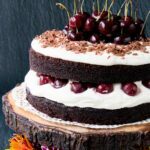 The sour cream is the magic ingredient that makes the cake so moist and tender. 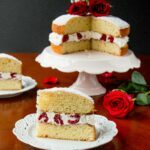 Then comes the beautifully colored rhubarb which gives the cake a gorgeous pop of pink and red while providing a soft delicate texture and lovely tangy taste. 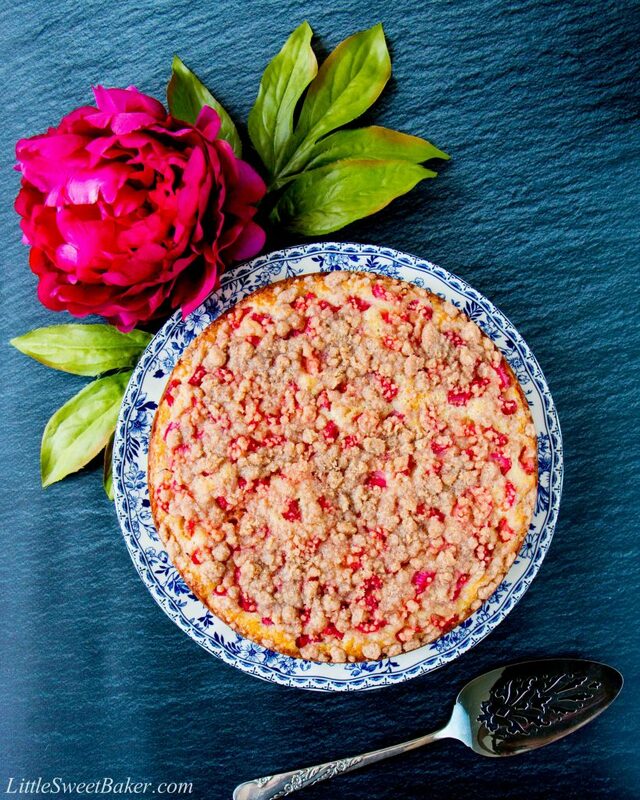 Last but not least is the streusel which gives the cake a crispy finish and sweetness to contrast the tartness of the rhubarb. It also provides a wonderful cinnamon scent that just makes your mouth water. 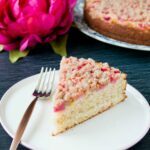 This is a moist sour cream coffee cake studded with beautiful pieces of rhubarb and topped with a sweet-cinnamon streusel. Preheat oven to 350F. Grease a 8″ or 9″ springform pan. Set aside. Toss together the flour, baking powder, baking soda and salt. Set aside. Using an electric mixer, beat together the butter and sugar until combined. Then beat in the egg, followed by the sour cream and vanilla. Beat until smooth. Stir in the flour until just combined. Batter will be thick. Spread the batter into the prepared baking pan. 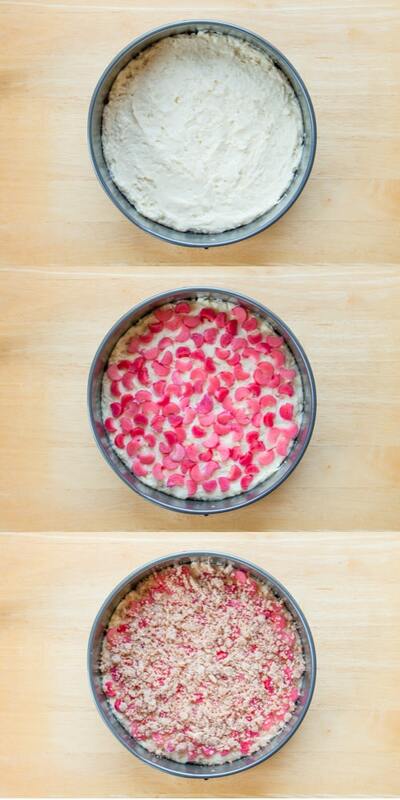 Layer the rhubarb on top. To make the streusel: toss together the flour, sugar and cinnamon. Add in the melted butter and mix everything together until all is moistened. Sprinkle on top of cake. Bake for 30-35 minutes or until a toothpick inserted into the center comes out clean. 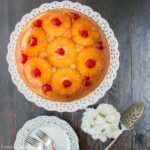 This cake can be stored in an airtight container or wrapped in saran and stored in the fridge for up to 3 days. Best served the day of or the day after.